I have a Game of Life program that has a grid array which is populated by Cell objects. If there's a cell in a grid square, that grid square is green. 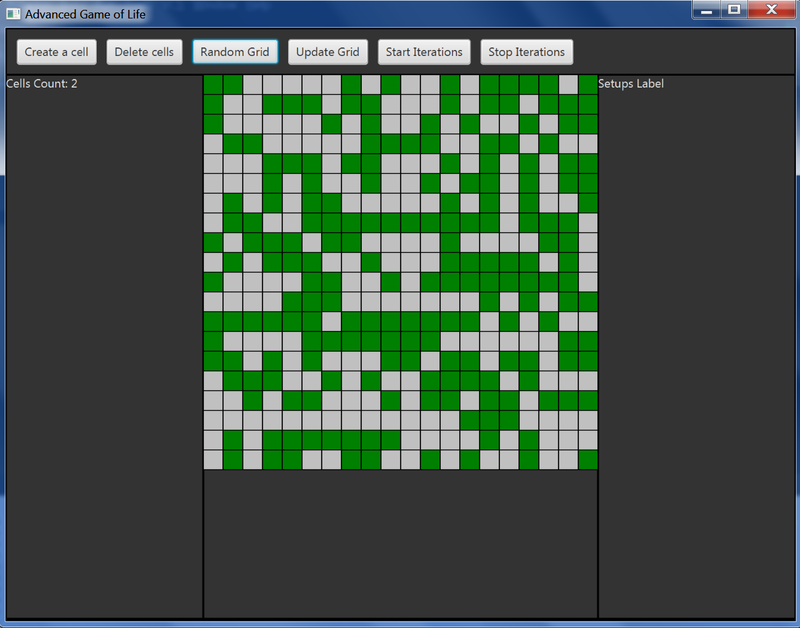 One can add the cells manually by clicking on the grid squares and turning them green. When a Start Iterations button is pressed a startIterations() method starts, which makes use of AnimationTimer. It all runs in the single thread, until there are no alive cells left or until 10 seconds pass. However, I still can interfer with that process by clicking on free squares and turning them green. Also I have a Stop Iterations button that invokes AnimationTimer's stop() method when pressed; I can access that button while the simulations are being run at it works OK. How is that possible, if there's only one thread? Even though it works OK, I have a feeling it's wrong to have everything inside a single thread. What is the better approach? Put animation in a separate second thread? It's a bit hard to tell since the code does not seem complete, but from your description it seems to be doing handleEvents()/renderWorld() in one thread (by Application itself) and updateWorld() in another (your AnimationTimer), that will give thread-conflicts. Create a queue of incoming events in handle() and process the queue in the updateWorld() thread. Multithreading is easiest to achieve in the updateWorld() part. This can be done by splitting the work that needs to be done into multiple threads, waiting for all of them to finish their work and then exiting updateWorld() so render() can commence. Another way would be to run updateWorld() in the background while renderWorld() is running, but the synchronization of that can be tricky to handle. Multithreading renderWorld() is beyond my capabilities. Not the answer you're looking for? Browse other questions tagged java thread-safety concurrency game-of-life javafx or ask your own question.